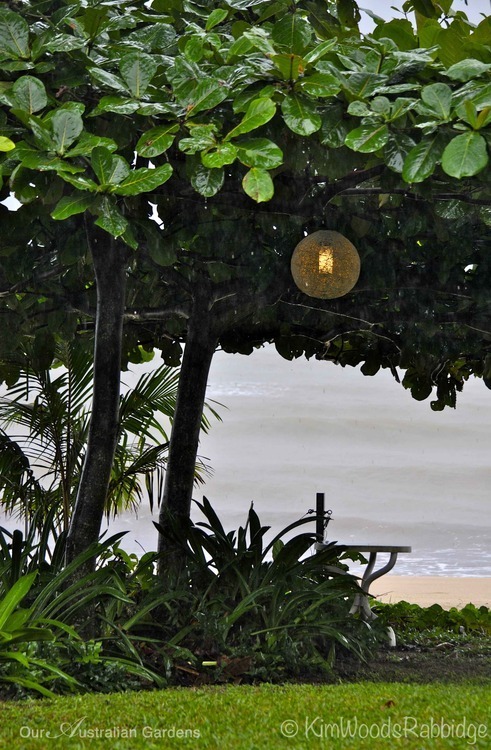 Holloways Beach, north of Cairns, is just a 10 minute drive from the centre of town but a world away. Its easy-going vibe is appreciated by the locals. 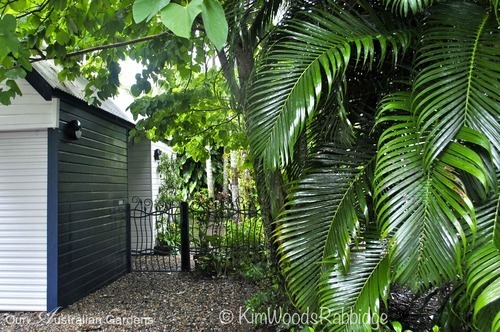 Down a sleepy laneway, the entry to the home and garden of Roger and Sarah Mainwood is overhung with palm fronds and bauhinia. Once through the hand-forged gate by Elephantus, the gravel path leads onto a boardwalk, and to their dwelling. 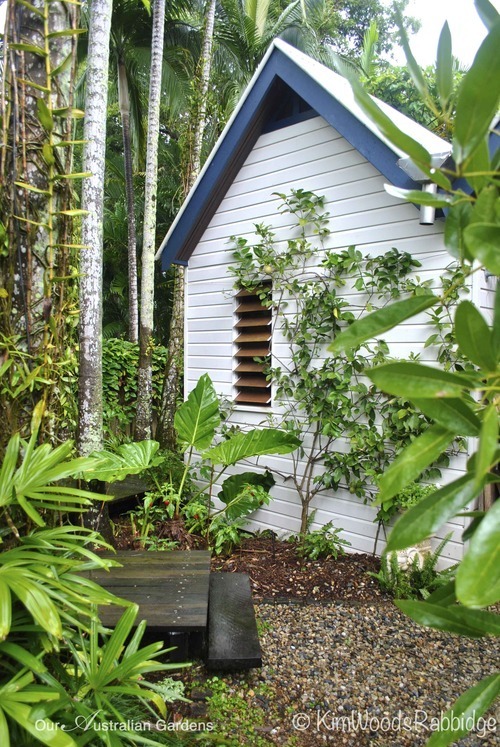 Roger’s an architect and Sarah studied design so the house and garden, set on a narrow seafront parcel of land, is a collaborative effort. 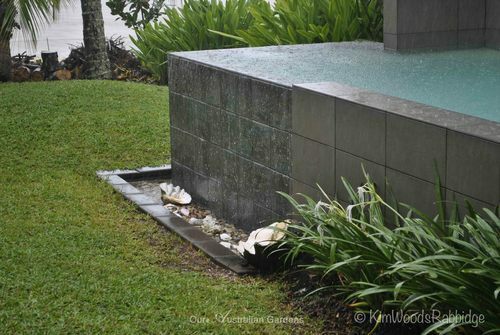 Plants and hardscaping have been positioned cleverly by the Mainwoods to maximise space. 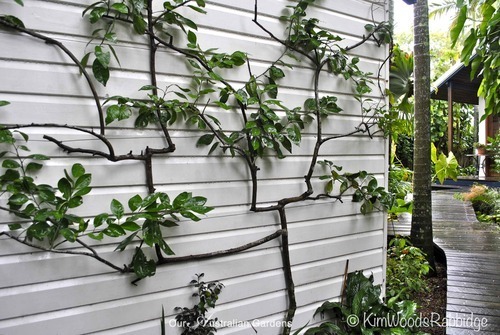 Espaliered citrus thrive in their sunny spot on the garage wall – a clever solution to space constraints. 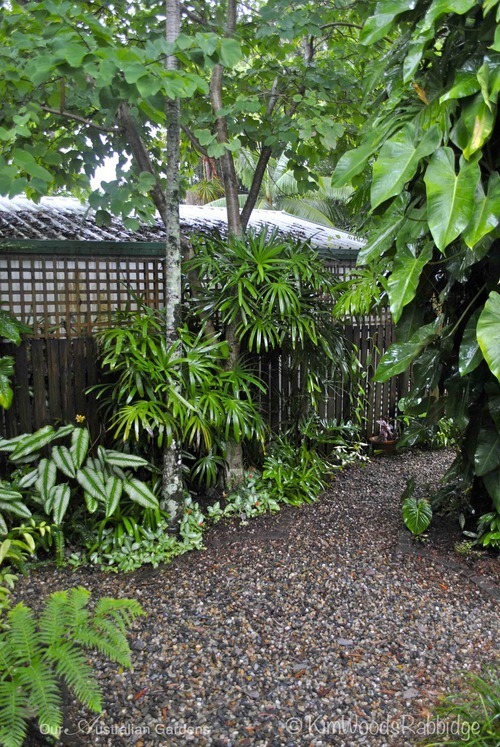 Aside from the citrus trees, the rest of the garden has a distinctly tropical air. 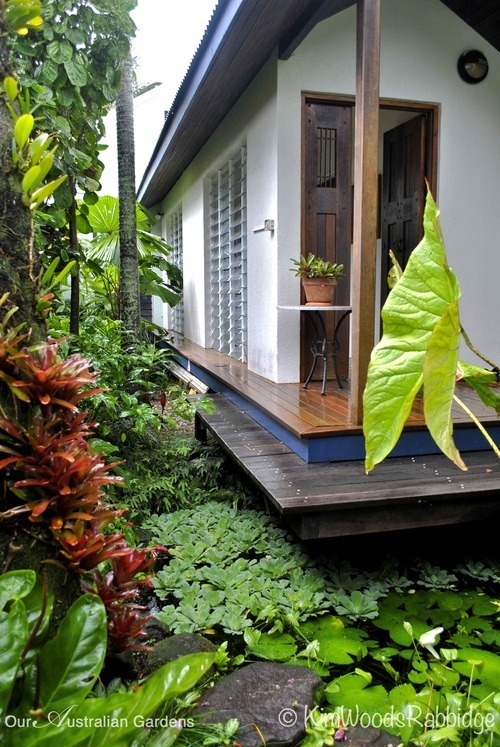 Palms, large-leaved and colourful foliage plants, and epiphytic elkhorns on palm trunks, all add lushness. 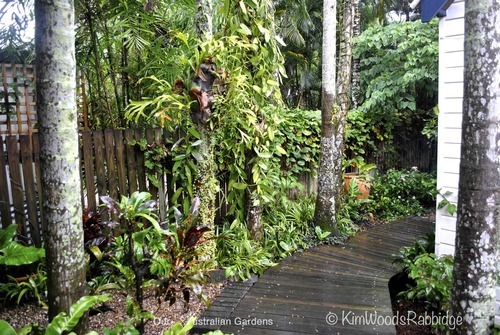 The wending timber boardwalk provides easy access and an elevated view. 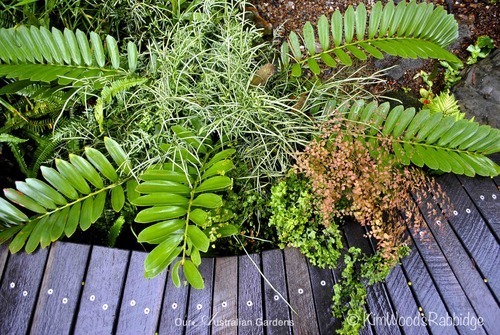 A combination of ferns and stiff-leaved Zamia – an exercise in contrasting textures and forms. 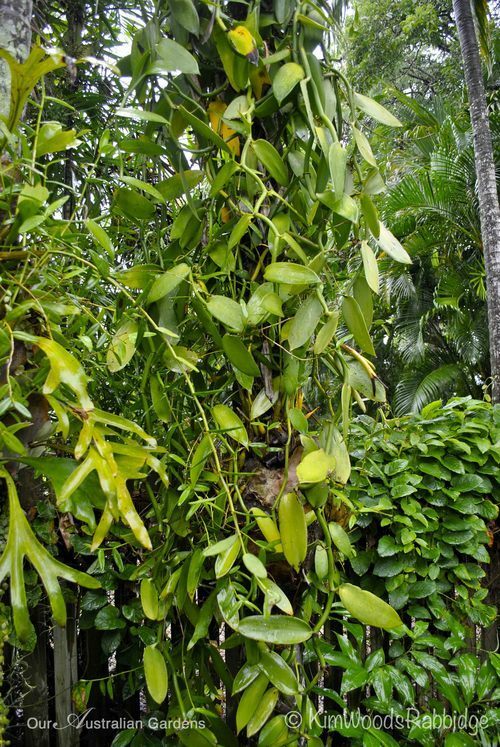 The developing pods on this vanilla orchid winding around a palm trunk, are testament to Roger’s success in mastering the tricky art of pollination. 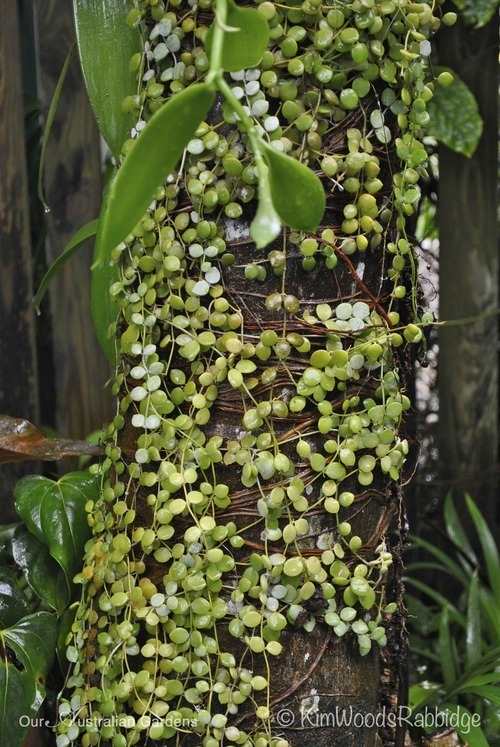 A spangled button orchid adorning the palm trunk benefits from filtered northern light. 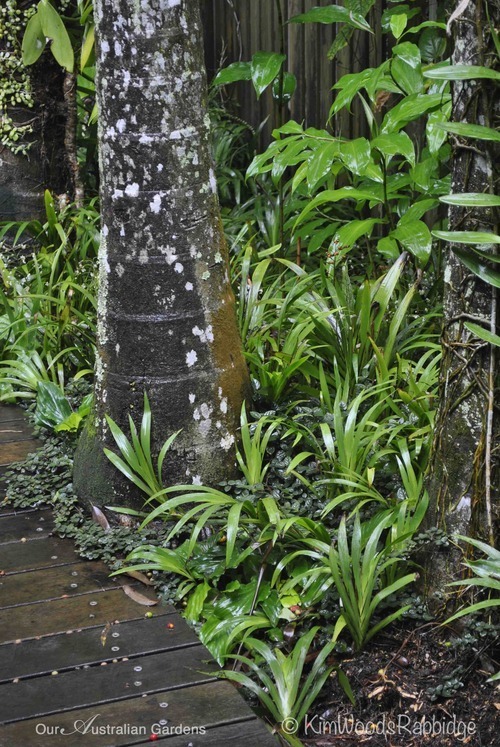 The corner of the house, sitting over a waterlily pond, is surrounded by lush green foliage with occasional highlights such as these russet aechmeas climbing on a tree trunk. 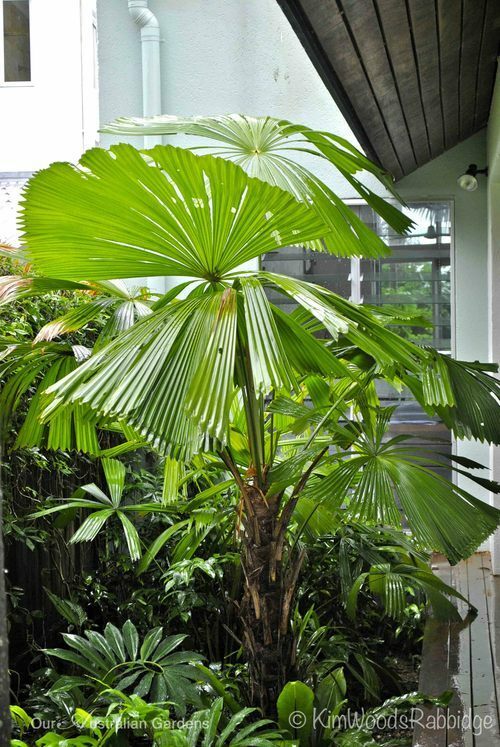 Licuala muelleri, a palm indigenous to north Queensland, fans over the understory of costus and gingers. 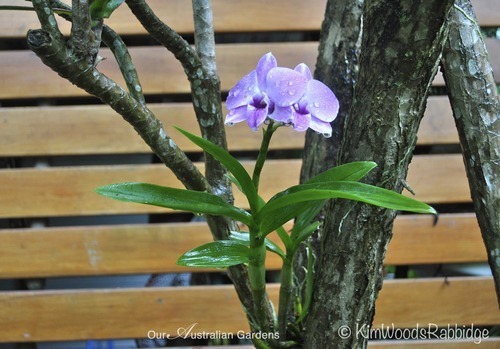 A flash of colour from an orchid anchored on the frangipani trunk. 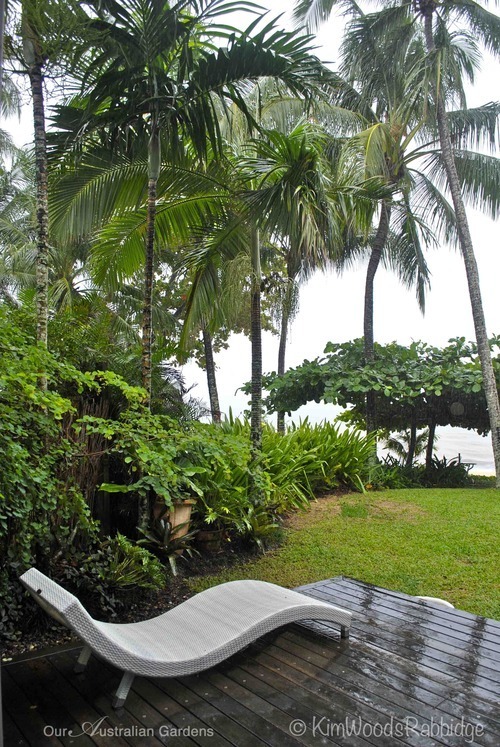 Even on a wild and rainy day the view to the water beneath swaying palms is lovely – and quintessentially tropical. 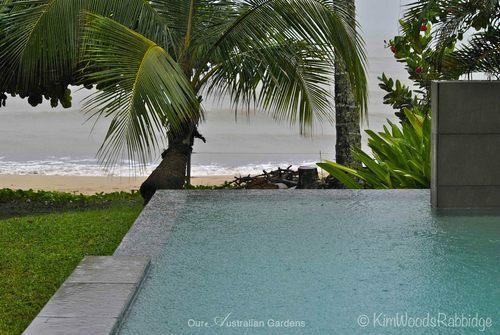 On average 2000mm of rain falls each year here, delivered in the wet season from October to May. 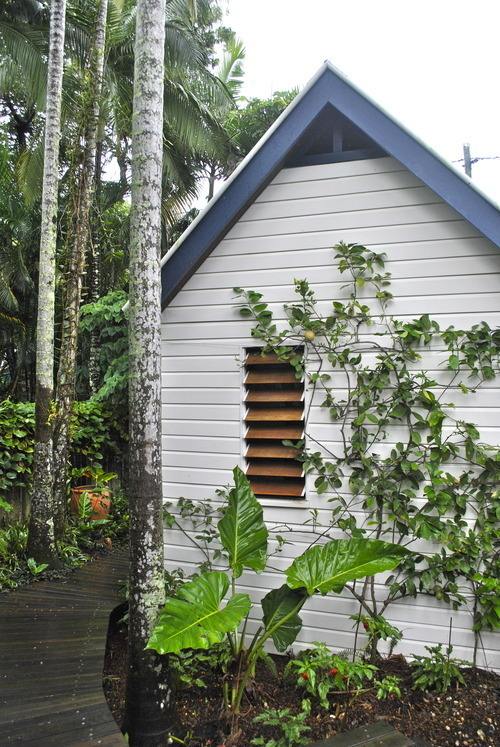 Locals build their houses to withstand the fiercest weather but sensibly, are prepared to evacuate during the worst storms. 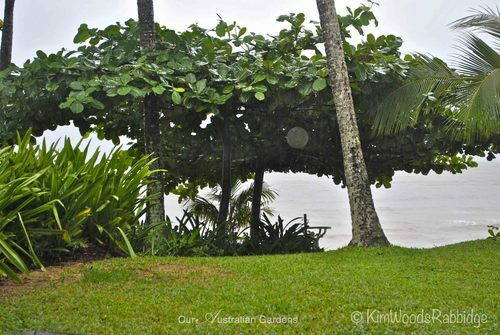 Memories of Cyclone Yasi in 2011 are still fresh in the local psyche but the gardens show little evidence of the destruction that was wrought then. This beautiful sea almond, Terminalia catappa, with a simple understory of crinum lilies does not detract from the drama of the sea beyond. 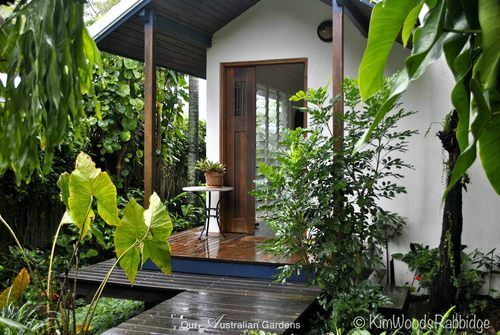 A sphere of light glows softly beneath the canopy, umbrella shaped by the Mainwoods. 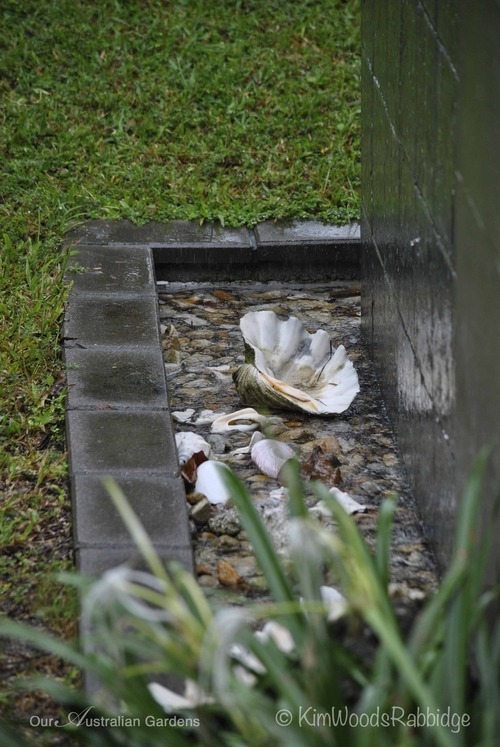 A collection of shells and stones, plus strappy-leafed Hymenocallis speciosa, border the raised pool on the garden’s edge. Much-sought-after clam shells are now available in Australia from Aquasearch. 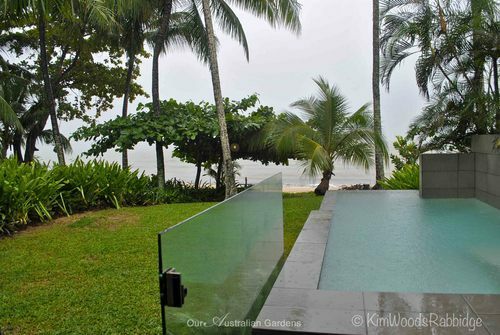 Grey undertones in the infinity edge pool echo the colour of the stormy sea. 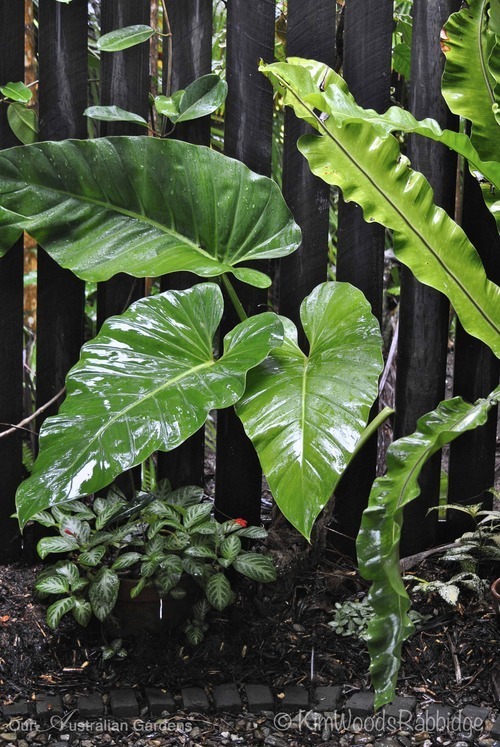 Philodendron on the tree trunks provide interest at eye-level and raphis palms blur the line of the fence. Cobblestone edges to the path reflect attention to detail in material choice. Rain intensifies colour and patterns including lichen on this palm trunk. 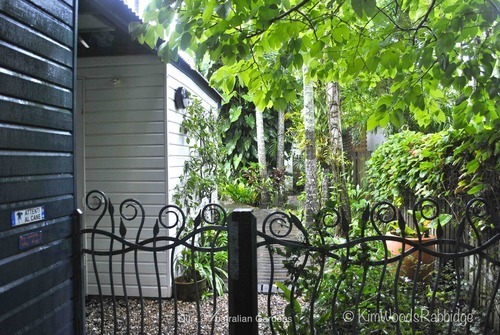 This small garden is jam packed with interest: many textures and many tones in the understory, at eye level and in the canopy.